Illustration and scanning electron micrographs of the NanoThermoMechanical rectifier. Credit: Elzouka and Ndao. Published in Nature Scientific Reports. (Phys.org)—Researchers have built the hottest thermal diode to date, which operates at temperatures of more than 600 K (326 °C). Thermal diodes may serve as the building blocks of future thermal computers, which could run at temperatures at which today's electronic computers would quickly overheat and stop working. The researchers, Assistant Professor Sidy Ndao and graduate student Mahmoud Elzouka at the University of Nebraska-Lincoln's Department of Mechanical & Materials Engineering, have published a paper on the NanoThermoMechanical diode in a recent issue of Nature's Scientific Reports. 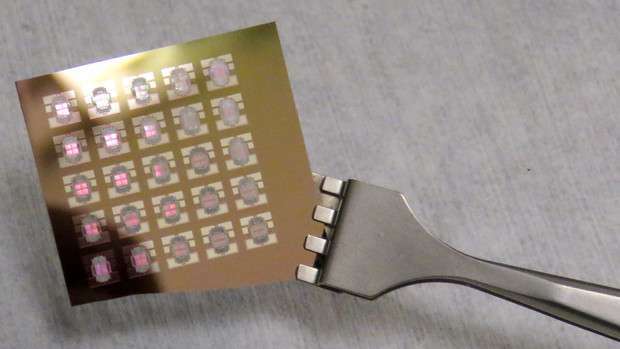 "Unlike electronics, NanoThermoMechanical memory and logic devices use heat instead of electricity to record and process data; hence they can operate in harsh environments where electronics typically fail. A few examples include the exploration of planet Venus with average temperature over 400 °C, and deep-Earth drilling for petroleum and geothermal energies. Also equally important is the opportunity that this technology presents for waste heat recovery with the development of thermal batteries." The function of a thermal diode is to allow heat to flow primarily in one direction but not the other, similar to how an electronic diode allows electric current to flow primarily in one direction. This ability to control the direction of flow enables diodes to produce two distinct levels of a signal, forming the basis for the "0" and "1" binary logic levels. The new thermal diode achieves two distinct levels of heat flow by controlling the distance between two surfaces: a moving terminal and a stationary terminal. The researchers showed that changing the relative temperatures of the two terminals changes the gap size between them, which changes the amount of heat transfer, which in turn depends on the direction of heat flow. This is the first time that the relation among these four factors—temperature, separation gap, heat transfer rate, and heat flow direction—has been exploited for use in a thermal diode. The entire device consists of 24 pairs of moving and fixed terminals, along with two thin-film platinum microheaters that independently control and measure the temperatures of each pair of terminals. When the fixed terminal is hotter than the moving terminal, the gap is large, resulting in a low heat transfer rate. When the moving terminal becomes hotter than the fixed terminal, the moving terminal moves closer to the fixed terminal and the gap decreases, leading to a higher heat transfer rate. At this scale, the heat transfer physically occurs due to a process called near-field thermal radiation, which results mainly from the tunneling of evanescent surface waves between two closely spaced surfaces. This demonstration is the first time that near-field thermal radiation has been used to operate a thermal diode at high temperatures. Doing this has been difficult due to the technical challenges in controlling the nanoscale gap. 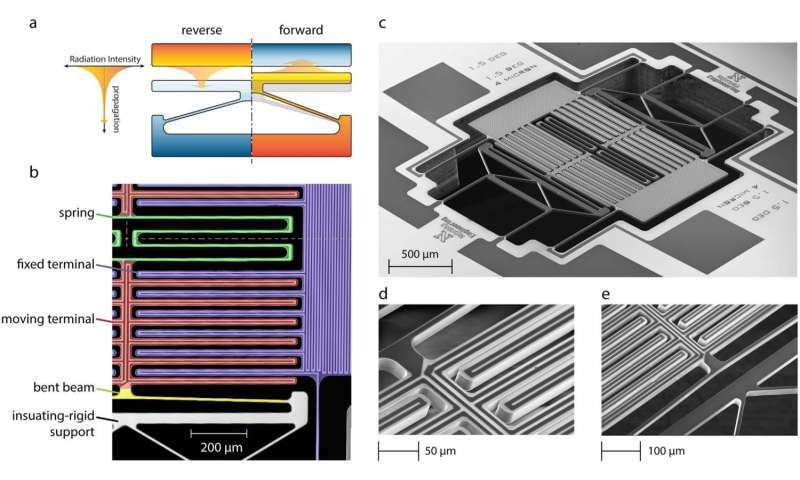 Tests showed that the thermal diode can operate at temperatures of up to 600 K, and the researchers expect that higher temperatures with improved performance are possible through design optimization. Another benefit of the method is that the thermal diode can be easily implemented, as it does not require exotic materials but instead uses standard techniques already known to the semiconductor industry.